Woolly Bear ( above) at Herbert Lake at start of Icefield Parkway. And some of my photos of our campsite view in Banff, a lake along the Icefield Parkway, my two guys walking the Campground path, and a riverside lunch stop. Charlie’s photos to follow some time soon. This entry was posted in Uncategorized on July 5, 2017 by Ramblin' Rose. After enjoying all Banf NP had to offer, we headed up the Icefield Parkway, past the glaciers and two bears! This road is extremely beautiful, with glacial streams, wildflowers, majestic mountains and the glaciers. One thing it doesn’t have is fuel for the RV, so we gassed up in Lake Louise at 6:30 in the morning. 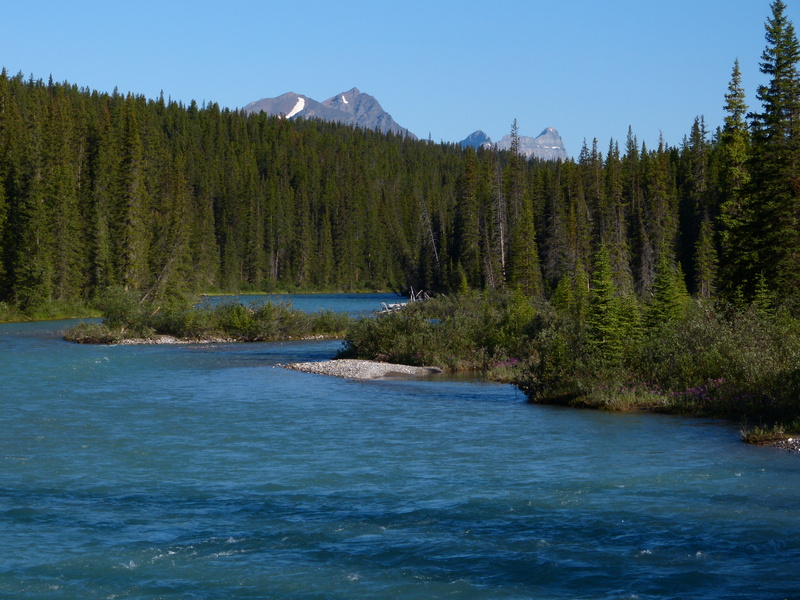 The only fuel available the entire length of the Icefields Parkway is at Saskatchewan River Crossing. Our first fun stop of the day was at Herbert Lake, where we had breakfast and walked down to the lake. We then drove by Crowfoot Glacier, Bow Glacier, and Peyto Lake. We stopped frequently for Charlie to take pictures and Woolly Bear to romp around. We stopped Midway at the Icefield Centre near Sunwapta Pass, and were dismayed to see how much the Glacier has melted since our last visit. At the Junction of 93A we passed Athabaskan Falls and then the trailhead to a favorite hike of mine, the Valley of Five Lakes. Finally we arrived at Whistlers Campground in Jasper National Park. Our site was 26F, and was a nicely wooded site with a picnic table and no visible neighbors. No hookups, but perfect for the three of us! We are heading to Hinton next, for a day of grocery shopping and laundry doing. The next day we will be on our way to the Alaskan Highway via the Big Horn Route and will be camping in some Provincial Parks we haven’t visited before. We can only post gen we have wifi, so it may be a while before I can update you on our trek. No worries, will catch you up when I can! This entry was posted in Alaskan Road Trip, camping, Canada, National Parks, Rving, Uncategorized on July 3, 2017 by Ramblin' Rose. After spending three nights at Glacier National Park, we headed the camper North to Banff. Our plan was to camp at Tunnel Mountain 2 at the same site we had camped at two years ago. It was an end site with views of both mountains and meadows, and I knew that Woolly Bear would have room to chill. We were dreading our trip through Canadian Customs, as we received the full camper search two years ago. I made sure all was neat and tidy, even to the point of making sure we only had clean clothes! We drove up to the window and were amazed that after a few cursory questions we were happily sent on our way! We stayed in Banff at Tunnel Mountain 2, with electric hookups, but we spent a day in Yoho National Park, visiting Emerald Lake and Takakkaw Falls. Yoho is a very scenic place, and we really need to spend more time there in the future. We also stopped at Lake Louise and Charlie took some pictures. There is a lovely hike up to a tea house on the side of the lake, we hiked it when Woolly Bear was younger. I was the only one of the three of us that wanted to hike it again, so we headed next to Morraine Lake. The road to Morraine Lake was closed!!! Apparently there were too many people there, and you really need to visit it before 8:30 am, or after 7 pm. We had spent lots of time there on previous trips, so our disappointment was not devastating and we just headed off to check out the Bow Lake wildlife loop. Even that was more crowded than I had remembered it being on past visits. Then I remembered that Canada is celebrating a very special 150th Canada Day this weekend! No wonder everyone was out and about! Entrance to all the National Parks and National Historic sites are free this season, and from the looks of the crowds, people are enjoying this! This entry was posted in Alaskan Road Trip, Canada, National Parks, Rving, Uncategorized on July 1, 2017 by Ramblin' Rose. After two days camped at Teddy Roosevelt NP, we aimed the camper North to Montana. What should have been an 8 our day turned into a 13 hour trek, but ended with awesome views of Glacier!!!! The Going To The Sun Road is still under snow removal, but we managed to see 7 Grizzly bears in the open 12 miles from St Mary’s. in addition, we spent our second day there at Two Medicine Campground and picnic area, one of my favorite places on earth!!! The wildflowers were the best I have seen, Bear Grass, lupine, columbine, etc flooding the ground. The weather has been cooperative and we are now heading for Banff National Park. We saw 7 Grizzly bears at St Mary’s and Chas has the photos, but I can’t access them yet! Will post the bears later:)! This entry was posted in Uncategorized on June 28, 2017 by Ramblin' Rose. The beginning of our trip was a bit hectic, as most beginnings are. We set the alarm clock for 4 am, planning to be on the road by 4:30. I thought everything was in order: had packed everything but the dog the day before, had prepped the coffee pot so it just had to be turned on, and had our travel mugs ready to be filled. Those that know me know I don’t function without my morning coffee:)! All should flow smoothly, or so I thought. What actually happened was not what I had planned. The coffee part was perfect, but when we hooked up the Jeep to the Winnie, the lights did not work!!! After a bit, Charlie found some contact spray and the connections worked perfectly, lights blinking in sinc. So we began our journey, only to get to I 95 and realized that someone didn’t have their good reading glasses ( and it wasn’t the one of us addicted to reading) so back home again. Had to park in the street because the camper towing the Jeep cannot go up our driveway, nor turn around if it did. Finally, at 5:30 am we were on the road. The next few days are a whirl of driving and camping at mostly 5 star rated commercial campgrounds. It costs a bit more, but the standard of quality accommodations is worth it at this time of our lives. We like KOA’s for the consistency of the services. We did stay at one 3 star, but quickly wished we had not. Even WB did not want to wander outside! Our first real stop was at Teddy Roosevelt National Park at the far end of North Dakota. This has long been a favorite of Charlie’s, but this time we had a rude awakening!!! Sometime in the last year or so they have started letting people reserve the campsites. We were operating under the old rules, first come, first served, and arrived at 9:00 a.m. Only to find that all the sites on the Little Missouri River and with a view of the mountains, were reserved ahead!!! The interior loop sites( read undesirable) were still up for grabs. So we found ourselves a nice site for the requisite $7 fee( senior pass is half price) and stayed in the 90 degree heat dry camping. Unfortunately, the majority of the pre-reserved sites remained unoccupied for the two days we were there. Now I will reserve my site ahead of time, but this time we were caught unaware after 35 years of first come, first served!!! We have better pictures, but they are on Charlie’s computer and inassessible at this time:) Will post wild horses later:). This entry was posted in Uncategorized on June 26, 2017 by Ramblin' Rose. Our 2015 Alaskan visit was cut short after we visited Valdez and Tok. We missed camping in Denali and touring the Kenai Penninsula so Charlie and I decided to go back to Alaska while the going is good! And we now have a better idea of what to expect along the AlCan. We have purchased new tires for both the Winnebago and the Jeep Wrangler, have changed the oil in both vehicles, and done whatever maintenance needed to be done. Charlie has agreed to share the driving with me, and I have practiced driving the Winnebago around town, just to get a feel for how a vehicle a foot wider than my Jeep handles on turns and on the highway. Our bicycles are packed, our refrigerator has been started, clothes have found their way to the camper, and the count down has begun. We are getting ready to ramble! We plan to visit some of our favorite places on our way North: Teddy Roosevelt NP, Glacier NP, Banff, Jasper and Yoho NPs, and visit some new-to-us Provincial Parks that we missed the last time around. In addition, we will take a left turn at Haines Junction and spend a few days on the ocean in Haines, then spend a few days at Kluane National Park, and visit Liard Hot Springs. I am hoping the road is in better shape than it was in 2015. We are a bit later in the season, so more of the repair work should be done. This may well be our last trek to Alaska, so we are intent on getting it right this time! 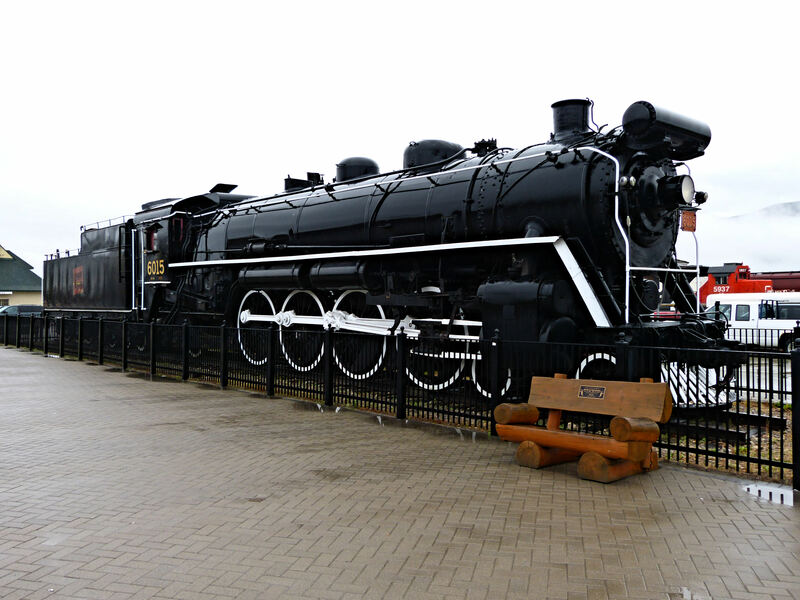 This entry was posted in 2017 "Back to Alaska" Trip on June 15, 2017 by Ramblin' Rose. I am taking a break from packing the RV for our “Back to Alaska” trek, and I realized we never posted last summer’s adventures. Last summer was a low key trip, in August, to the Badlands, Grand Tetons, Yellowstone, and Glacier. Buffalo on our walk around the campground. Highlights included driving through the Big Horn Mountains, dry camping at Colter Bay in the Tetons, camping in Yellowstone at Fishing Bridge, and driving the Going-to-the Sun Road in Glacier National Park. We were only gone for three weeks, but saw plenty of animals and beautiful scenery! This entry was posted in Uncategorized on June 11, 2017 by Ramblin' Rose.